DAVID HOSACK. 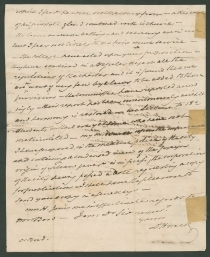 Autograph Letter Signed, to Samuel Bard, November 26, 1820. 4 pp. plus autograph address to “Doctor Samuel Bard / Hyde Park / Dutchess County” with manuscript and stamped philatelic markings. 8⅛ x 10 in. I am happy to hear that you still find your health improved. your Rheumatic complains will doubtless occasionally be renewed during the continuance of cold weather. I cannot but believe that it is a wise measure on your part to abandon the duties and with them the cares and anxieties of your station in the College. I do not however think it necessary that for this purpose you should resign the office. I am persuaded the Regents have but one wish on that head and certainly it would also be the desire of the majority of the Trustees of the College that you should continue to hold it. The duties to be performed it is expected under the circumstances of your absence or ill health will be rendered by those next in office and for which purpose those offices have been created. Conversing with the Governor he earnestly expressed the wish that you may not withdraw. If, however, <2> you persist in your present intentions, I shall thro my friends certainly urge those claims that I conceive I possess from actual services to the Institution and from my situation as Senior Professor and Trustee. I fear however such interest without your aid, will be of little avail. your advice on that subject I am persuaded will be the guide of the Regents. But if, contrary to the tenour of your favour of September last, that be withheld, which may be the best if I am not restored to the place I once held in your estimation by the explanations and apology I have offered for the inconsiderate tho not intentionally hostile act toward you, your silence in such case will be construed by the Regents as either not approving of me as you successor or that the breach in our friendship has not been healed which will be equally unfavourable to my views, for certain of that Board will make use of every such advantage that can be obtained, to carry their point and to gratify their hostile feelings towards me. <3> In that case I shall be again superseded and the station probably given to the present vice President. my brother Alexr is confined by a severe disease <4> which I fear he will not recover from. a disease of his prostate gland combined with ischurie. the lancet, warm bathing, and mercury are in use but I fear not likely to do him much service. The college have acted upon your proposition. they have combined in a regular digest all the regulations of the charter and it is found that we are in want of very few byelaws to be added to those provisions. the committee have reported accordingly. their report has been unanimously accepted and harmony is restored. we lecture to 182 students. there are yet some who have not matriculated. 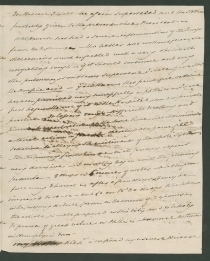 my discourse upon the improvements I have proposed, in the medical police of the city and containing a condensed view of the foreign origin of yellow fever is in press, the corporation of the city having passed a vote requesting a copy for publication. I shall have the pleasure to send you a copy in a few days. Samuel Bard opened a medical school at Columbia in 1767, but due to the Revolutionary War the school closed in 1776. In December 1784, the faculty were reinstated, and in 1791, Bard became the dean. In 1807, the New York State Board of Regents founded the College of Physicians and Surgeons, and in 1811, Bard became its president. In 1814, the Columbia University Medical School and the College of Physicians and Surgeons merged. 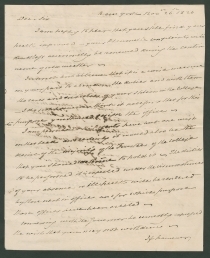 In 1811, the state of New York purchased Dr. Hosack’s twenty-acre Elgin Botanic Garden for $74,000 and assigned it to the Regents of the University, who placed it under the care of the College of Physicians and Surgeons “for all medical purposes” and for instruction in botany and materia medica (study of drugs used in the treatment of disease). However, the maintenance of the botanical garden was troublesome, and they transferred it to Columbia College in 1816. Rockefeller Center was built on the site with leased lands; Columbia University sold the land in 1985 for $400 million. By the time Hosack wrote this remarkable letter, Samuel Bard had retired to his estate in Hyde Park, and was contemplating resigning as President of the College of Physicians and Surgeons. Hosack’s “ardent temperament and undoubting self-reliance led him to the front in many controversial discussions; and his views were always maintained with force and ability.” This temperament made Hosack some enemies. Bard remained as President until his death, when he was succeeded by Dr. Wright Post, professor of anatomy and physiology. In this letter, Hosack also proudly announces the imminent publication of his work on yellow fever. His findings on its origins and contagiousness, as well as his recommendations about improving public health policy, had already been influential. Shortly after Hosack started his medical practice in New York, a series of yellow fever outbreaks killed thousands in New York, Philadelphia, and other cities. In opposition to Philadelphia’s famed physician Benjamin Rush (1746-1813), Hosack correctly argued that bleeding and purging with calomel (mercury chloride) were useless as treatments against yellow fever. David Hosack (1769-1835) was born in New York City to a Scottish immigrant merchant and his wife. He attended Columbia College, initially interested in art, but he soon became fascinated by medicine. He transferred to the College of New Jersey (Princeton University), from which he graduated in 1789. He attended medical school at what is now the University of Pennsylvania, graduating in 1791. After a year in Alexandria, Virginia, he opened a practice in New York City. He soon pursued additional education at the University of Edinburgh, where he became one of the leading American experts on botany. Hosack returned to New York City by 1796 and reopened his medical practice. Hosack served as Hamilton’s family doctor, and attended Philip Hamilton after his fatal duel with George Eacker in 1801. Three years later, as a friend of both parties, at the same spot, he attended the duel in which Alexander Hamilton was fatally wounded by Aaron Burr. After Burr was acquitted of treason in 1807, Hosack loaned him money for passage to Europe, where Burr lived for several years in self-imposed exile. Hosack was a pioneering doctor, studying and publishing works on cholera, yellow fever, and smallpox. He was also dedicated to teaching. He was a professor at Columbia from 1795 to the 1820s, in subjects including natural history, medicine, botany, and obstetrics. In 1799, he opened the first maternity clinic in New York. He also spearheaded the merger of the College of Physicians and Surgeons and Columbia University. After he fell out with that group, he helped organize the medical department at Rutgers College in 1826 and another medical college in New York in 1827. Both were short-lived due to push-back from the New York City medical community. Hosack was also one of the founders of the New-York Historical Society and served as its fourth president (1820-1827). In 1814, he was elected a member of the American Antiquarian Society. Samuel Bard (1742-1821), born in Philadelphia, graduated from King’s College (Columbia University) in 1758, before traveling to Europe for a medical education. He spent five years in France, England, and Scotland, and earned his M.D. at the University of Edinburgh in 1765. When he returned, he entered into partnership with his father. He married his cousin Mary Bard (1746-1821), and they had six children. Samuel Bard founded the first hospital in New York City in 1769 and formed the plan for a medical school. He left the city during the Revolutionary War, but he soon returned to secure his property and worked as a physician while the British occupied the city. After the war, George Washington selected Bard as his personal and family physician while in New York. In 1791, he helped found the New York Medical School at Columbia College. Bard and Dr. David Hosack, were physicians to Alexander Hamilton and his family. Bard retired from his profession in 1798 but returned to the city when a yellow fever epidemic again appeared in 1803. Bard and his wife died one day apart six months after this letter. Eight years later, Hosack purchased the Hudson River estate that Bard had built in Hyde Park. Hosack remodeled and enlarged the house and recommenced developing a botanical garden. It is now the location of the Vanderbilt Mansion National Historic Site. Very good. Expected paper folds including some brittle. The last page is reinforced in three places, which could be removed by a conservator. Isolated areas of ink bleed through. “prussic acid” is hydrocyanic acid, a highly poisonous solution of hydrogen cyanide in water. Hydrogen cyanide is obtained from the pits of fruits such as cherries, apricots, and apples. “phthisis” is pulmonary tuberculosis or a similar progressive systemic disease. “humoral asthma” is now known as chronic bronchitis, marked by difficulty in breathing caused by a great amount of fluid in the chest. “hemoptysis” is coughing up of blood from the respiratory tract. “ischurie” is the inability to urinate. Alexander Hosack (1756-1826) died nearly six years later in Lexington, Kentucky. 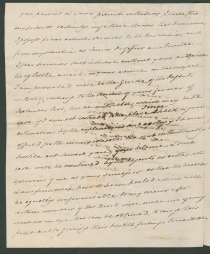 David Hosack, Observations on Febrile Contagion, and on the Means of Improving the Medical Police of the City of New York (New York: Elam Bliss, 1820) argued that filth was not a necessary or sufficient cause of yellow fever but recommended sanitary measures because filth could increase vulnerability to the contagion. John Call Dalton, History of the College of Physicians and Surgeons: In the City of New York (New York: Columbia College, 1888), 40.